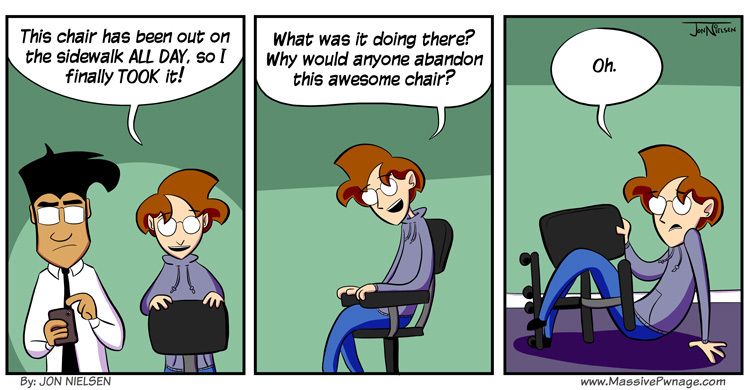 My chair broke the other day. The bolt holding the back snapped in half. It wasn’t fun. But don’t worry, after a few days of using a backless chair, I fixed it! This entry was posted on Wednesday, April 18th, 2012 at 12:00 am and is filed under Comics. You can follow any responses to this entry through the RSS 2.0 feed. Both comments and pings are currently closed. Fact for today: Yogscast is making a game called Yogventures, a minecraft styled game. …When did comments about a comic not relate to the comic itself more than either advertisements on the website or advertising other things such as Yogscast…*cough* These need to be filtered.